Cambodia Angkor Air will launch a regular flight service between Siem Reap and Siha­noukville by the end of the year, an official at the Council of Mini­sters said yesterday. There are currently no flights to Siha­noukville, the country’s premier coastal resort, even though the airport there was upgraded to international standards in mid-2009 and the private sector has pushed hard for Angkor Air to start scheduled flights to the coast to boost tourism. Council of Ministers Secretary of State Tekreth Samrach, who was appointed by the government to help set up the national carrier, said that Angkor Air—a joint venture with Vietnam Air­lines and the government—had made the decision to fly to Sihanoukville on the back of growing tourist ar­rivals to Cambodia. The total number of visitors arriving by air in Cambodia in­creased by 13.4 percent to 1.4 million people in the first six months of the year. “Around November is possible. We want to have a flight as soon as possible,” he said, adding that the national carrier would add an Airbus 321 to its current fleet of aircraft — one Airbus 321 and two ATR 72 — in November. Angkor Air is primarily looking into flights between Siem Reap and Sihanoukville but the airline has not written off the possibility of starting a connection between Sihanoukville and Phnom Penh, he said. Vann Chan Ty, deputy financial manager at Angkor Air, declined to comment, referring all questions to the State Secretariat of Civil Aviation. Soy Sokhan, undersecretary of state at the SSCA, confirmed that Angkor Air was on track to start flights between Siem Reap and Sihanoukville, but he declined to provide details. Earlier this month officials from the Ministry of Tourism, Cambodia Angkor Air and Societe Concessionnaire des Aeroports, the national airport operator, held a meeting during which the airline announced its interest in starting flights to Sihanoukville, according to a participant at the meeting. Members of the private sector have been frustrated by the lack of urgency in bringing scheduled flights to Sihanoukville. Many believe the city will only develop into a globally recognized coastal destination once tourists start to arrive by air. Analysts say there is a market to support regular flights to Sihanoukville. 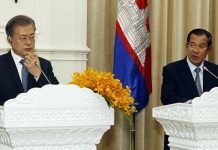 According to a report published in January by Frederick Thomas, an economist at the International Finance Corporation, the World Bank’s private sector branch, the number of tourists visiting Siem Reap and Sihanoukville during their stay in Cambodia justifies starting regular flights between the two destinations. 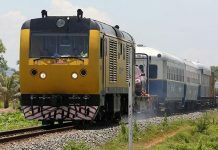 The report said that of the more than 150,000 international tourists visiting Sihanoukville every year, 33.2 percent were likely to go to Siem Reap as well. It predicted the number of people flying per week between Sihanoukville and Siem Reap would range from 161 to 319, depending on the season. 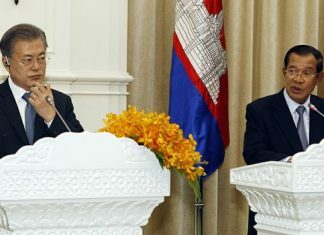 “When we have regular scheduled flights out, travel agencies will make new pitches,” said Luu Meng, president of the Cambodia Hotel Association, adding that an air route between Sihanoukville and Siem Reap would also open up cargo opportunities for transporting fresh seafood from Cambodia’s coastline. Currently, many of the hotels in Siem Reap import seafood from Thailand, Malaysia and Vietnam. Mr Meng said that flights into Sihanoukville would also open markets for tourists to places like Kep and Kampot provinces, both of which are not far from Sihanoukville International Airport. “Everyone is well prepared. They’re just waiting for flights to start,” he said.